Our parish is pleased to support two cemetery's they are St. Mary's Cemetery (Geneseo, NY) and St. Patricks Cemetery (Mt. Morris, NY). The cemetery offices are located at St. Luke the Evangelist, 13 North St., Geneseo, NY 14454. 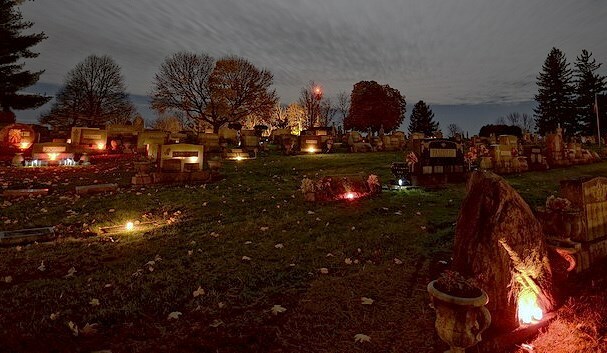 As darkness falls and candlelight fills the cemetery, join us to share Words of Remembrance, music, a cemetery tour and refreshments as we pause to reflect and remember all who have died and are buried at St. Mary's Cemetery or somewhere else. Place your candle(s) at the grave of somene buried at St. Mary's or in front of the Statue of Mary for someone who has died but not buried in St. Mary's Cemetery. Candles are $5.00 each at the event. For use at St. Mary's Cemetery only as holders will be collected and reused. If you are unable to attend, candle(s) may be purchased in advance for $10.00 each. The candle(s) will be placed for you graveside or in front of the Statue of Mary. Please print and complete this form if you are not able to attend. This form and payment are due to St. Mary's Cemetery Office by 11/2/2018.